4-6 weeks later, it all comes together and is shipped to you anywhere in the world for FREE - it has never been easier! 1) Select the Blade length. From 26" to 29". 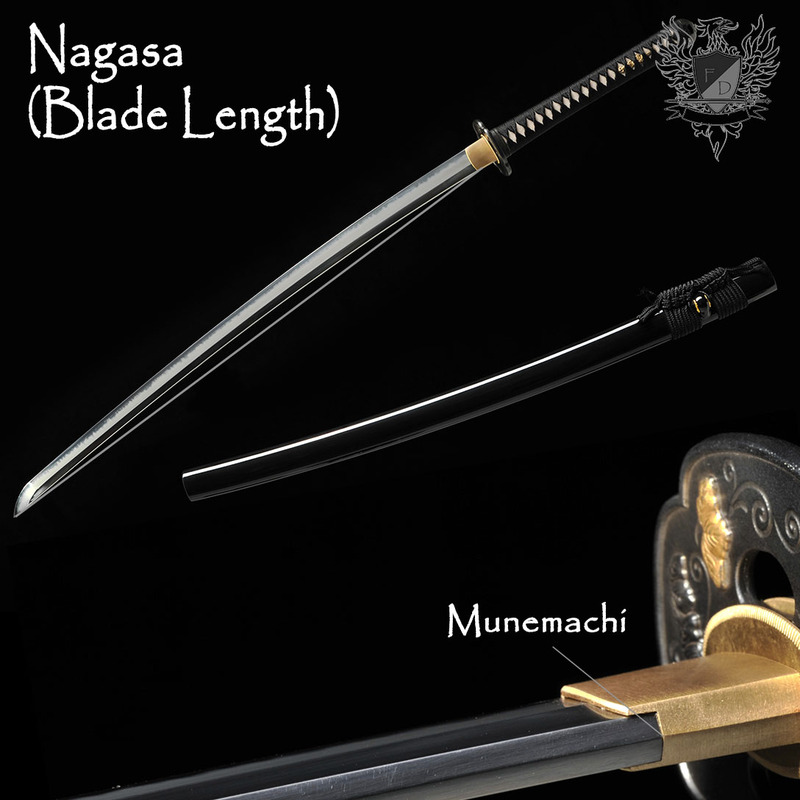 The length is measured in the traditional way from the back notch of the habaki blade collar (the Munemachi) to the very tip of the kissaki. Shorter blades create a faster sword suited for versatile use, longer blades suit taller practitioners and those who like to get the most steel in their blade possible for heavy, powerful cuts. 2) Select the fuller/blood grove. For the strongest blade possible (power cutter) select the solid bodied blade option. For the fastest, lightest blade possible select full bo-hi. For a mix between the two, select partial bo-hi. 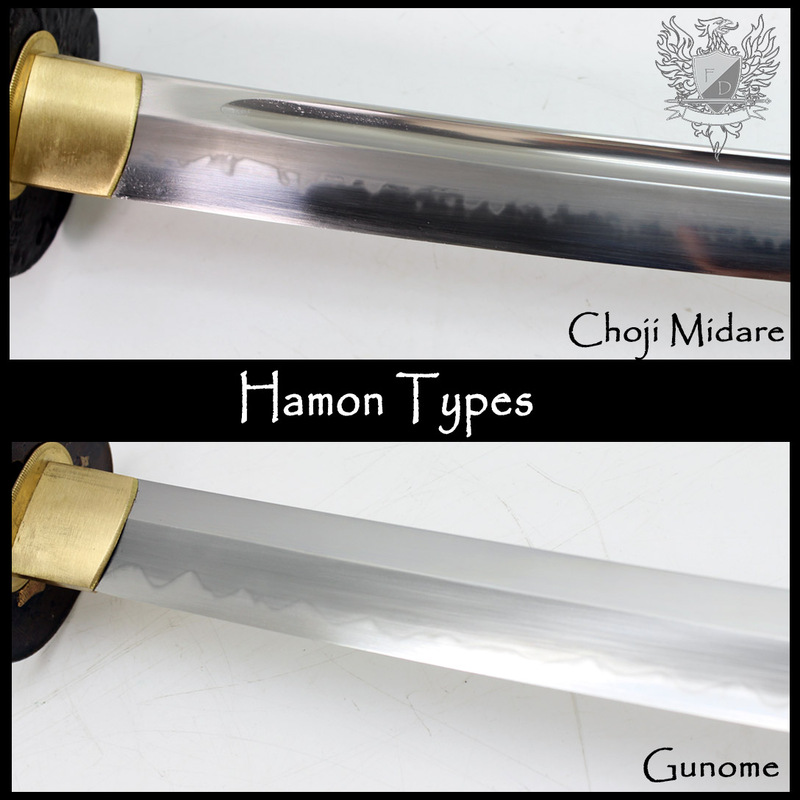 3) Select the hamon - either Choji Midare or Gunome Midare (see the pic for the difference). 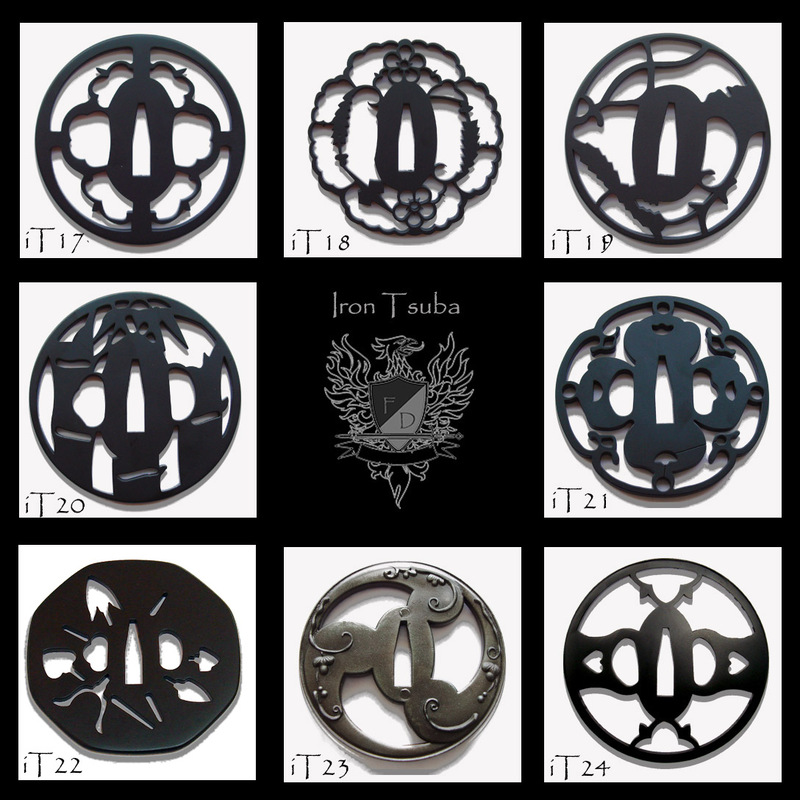 4) Select the Koshirae (furniture) theme that best suits your style. 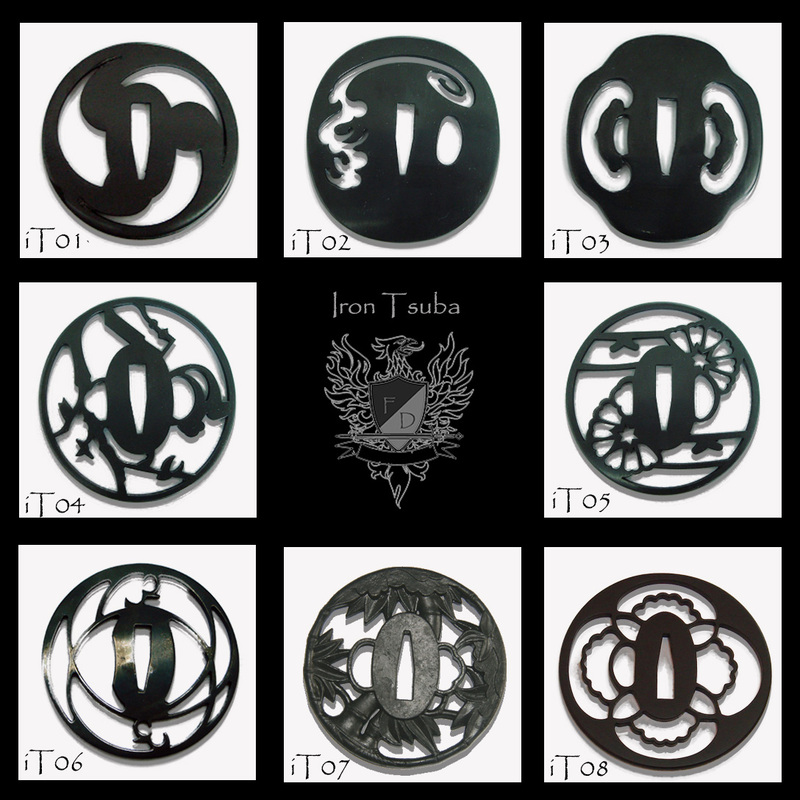 Either a solid iron set with plain fuchigashira or complete work hardened copper set - it is up to you. All fittings are of the highest quality. 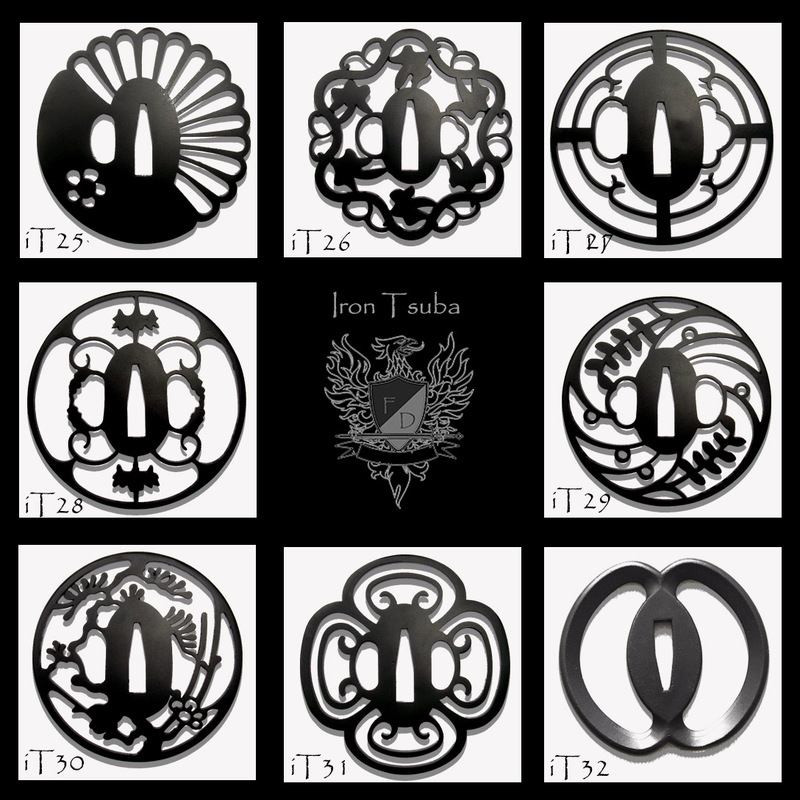 Elite Sets T0031-0037 (the Dragon sets) only depict the tsuba but also come with Dragon theme fittings (naturally). 5) Select the color of the silk ito maki wrap. From gold to black to brown, red and everything in between. 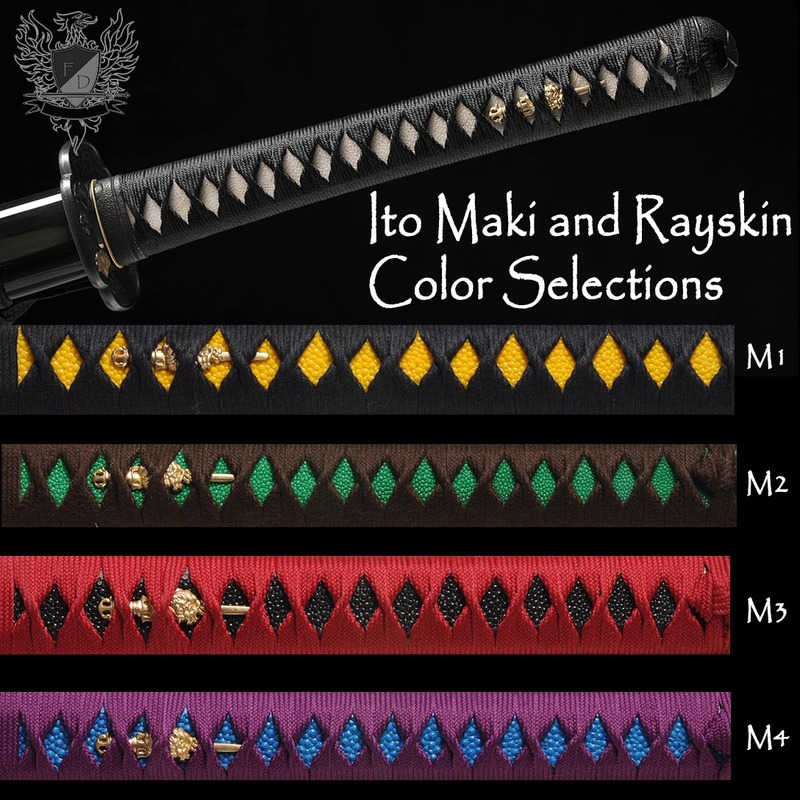 6) Select the color of the rayskin under the ito maki wrap. 100% real rayskin is used in all cases, and can be left white or colored black, red, yellow, green or blue. It is up to you. 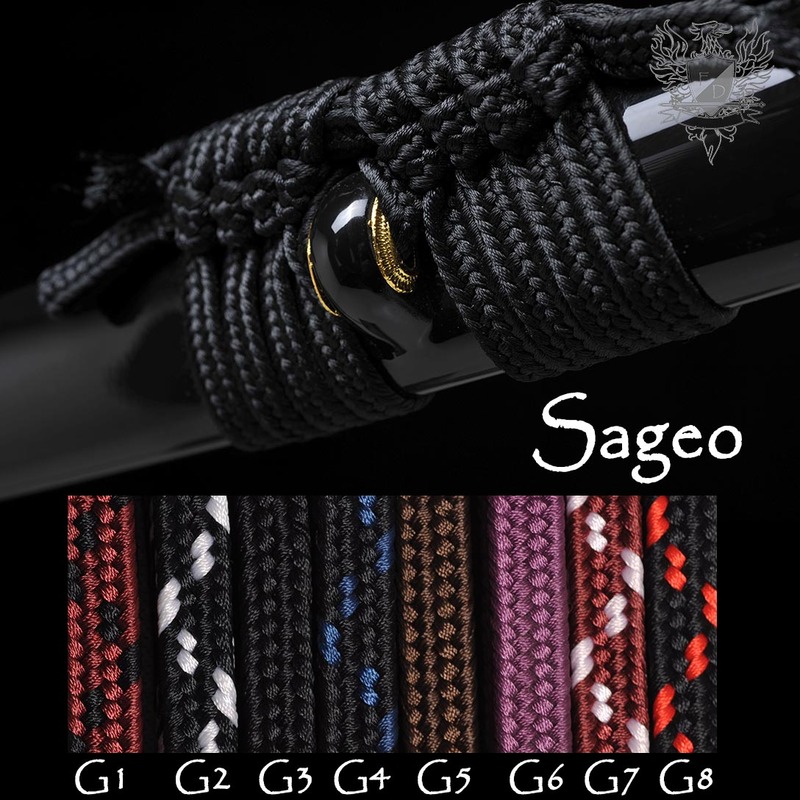 7) Now select your choice of hard wearing, thick sageo to go on the saya. When in doubt, go with a simple color that closely compliments the ito maki wrap you have selected. 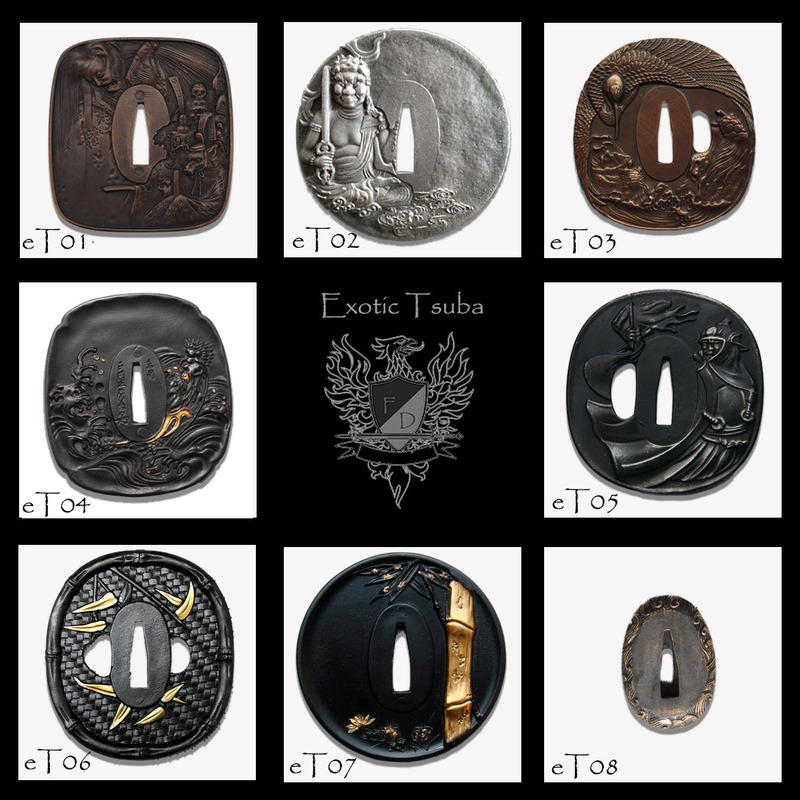 8) Finally, select the saya to give it that last personal touch. 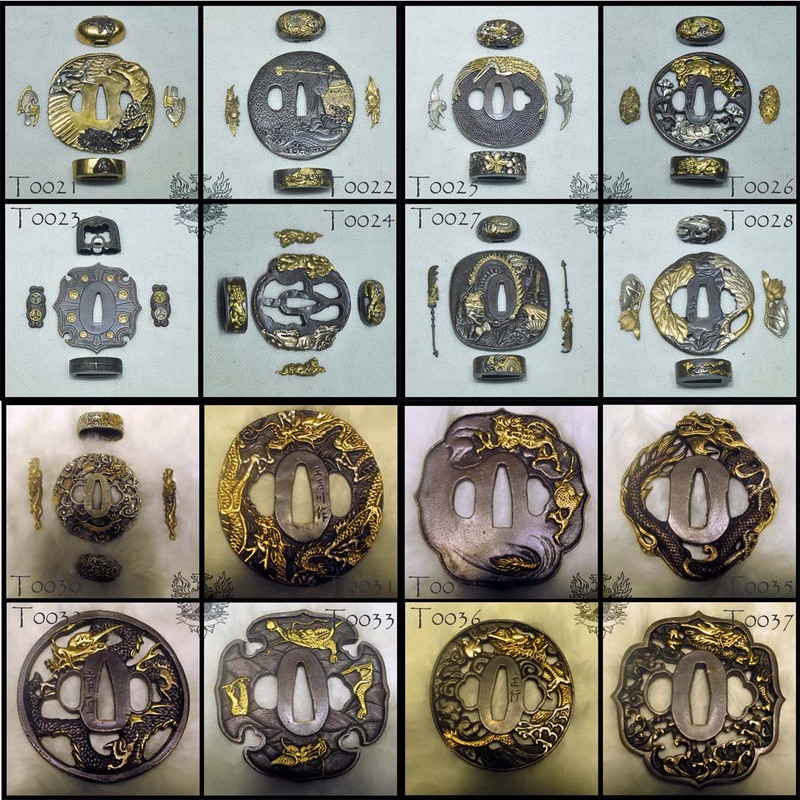 From simple monocolored lacquer to highly detailed mother of pearl or ornately painted, be as simple or as elaborate as you like. 26-29" Blade (you select) measured from Munemachi to Kissaki. 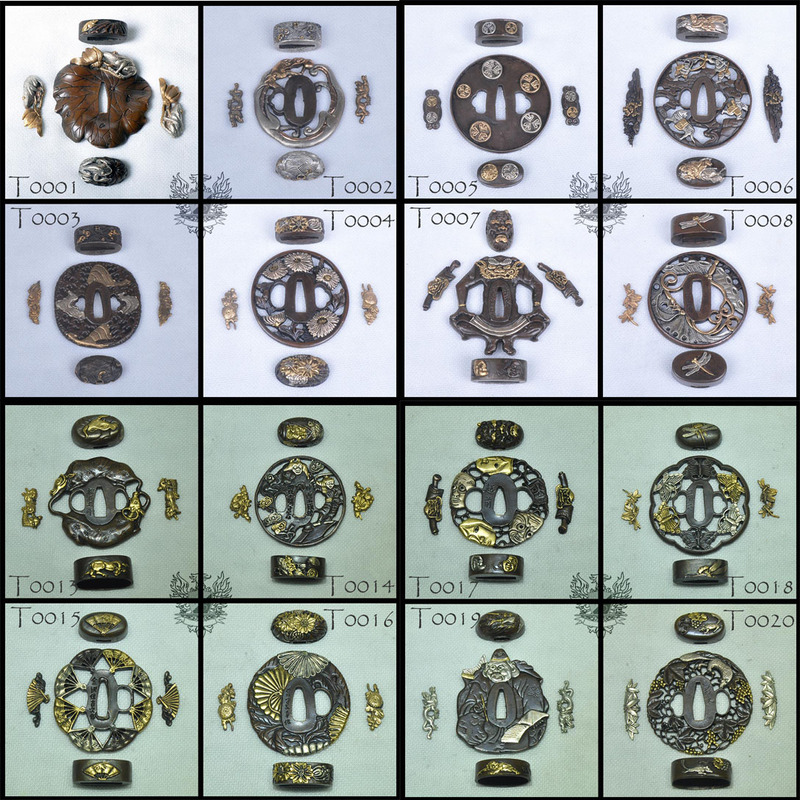 Weight will vary depending on fittings and blade length but typically between 2-2.4lbs (0.9-1.1kg). Differentially hardened fully sharpened Master Smith T10 Tool Steel blade with real hamon (two available types) and elite polish. 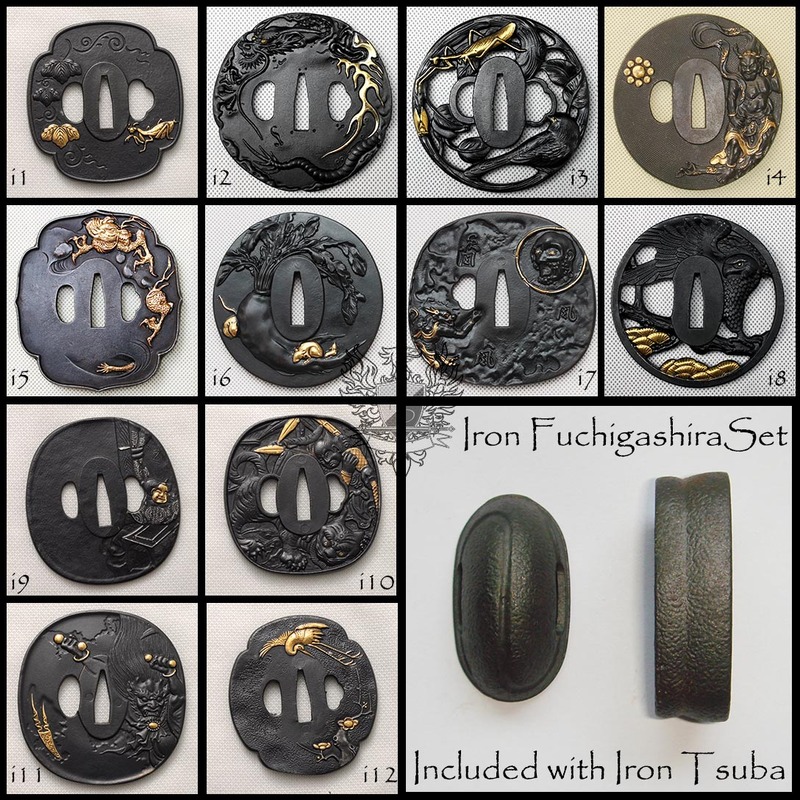 Your choice of premium quality, traditional and durable tsuba/fittings. 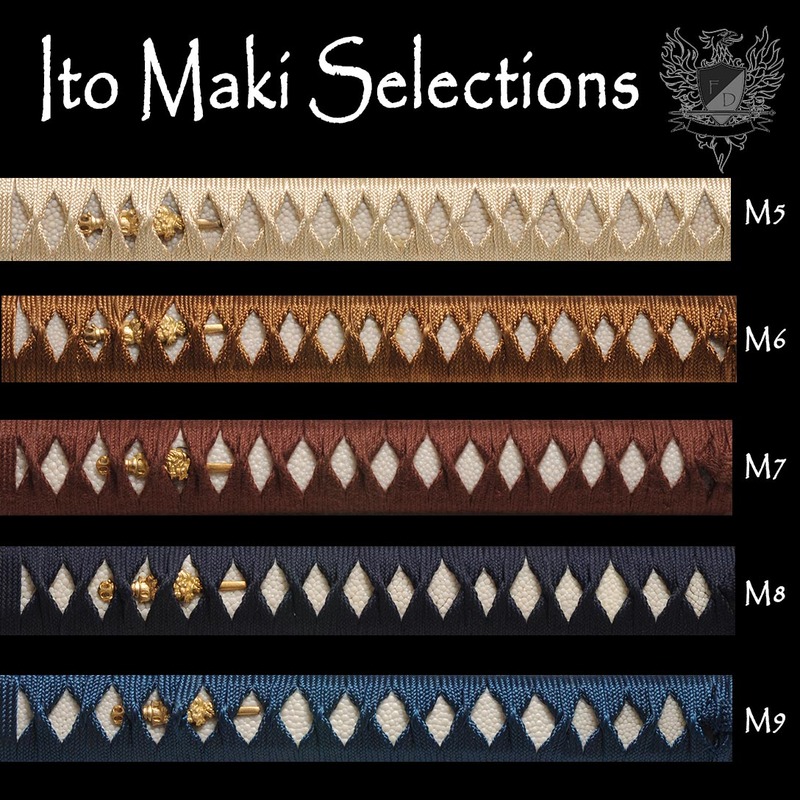 Silk Ito hineri maki wrapped tsuka in your selected color over authentic rayskin (available in 5 colors). 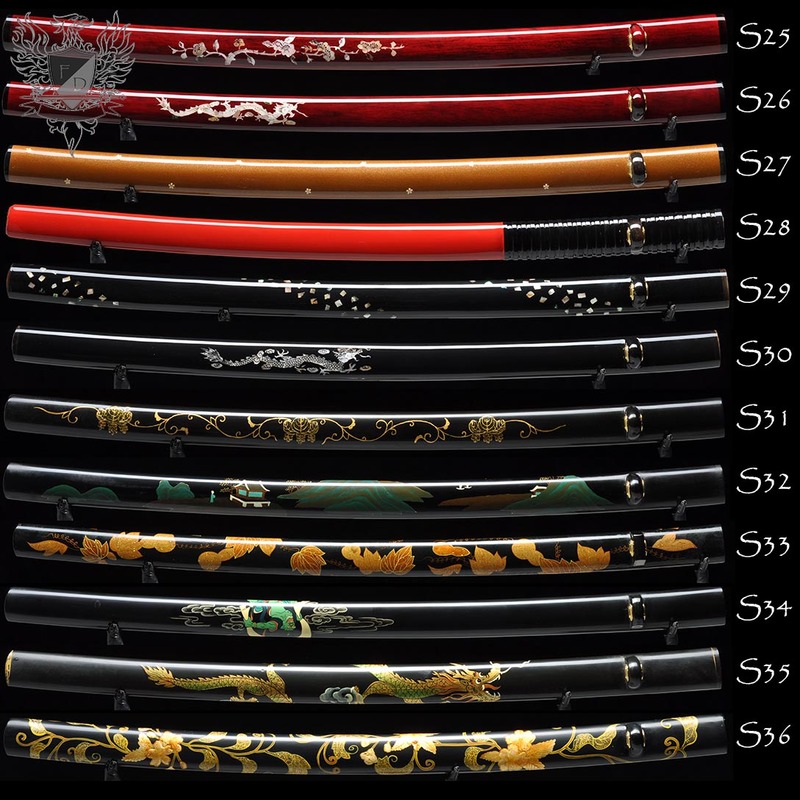 Wooden lacquered saya in your choice of color and style, including mother of pearl and highly detailed hand painted options. It turned out EXACTLY as I had imagined. I am not including photos because the website does an excellent job of describing the options - besides it is up to you to create something that is unique for only you. It might be helpful to potential buyers to learn how I decided to do this. I have designed, created, collected & sharpened various knives for years - but never swords or specifically katanas. My wife bought for me for Christmas a katana from a U.S. mainland based company. I will not mention the name. 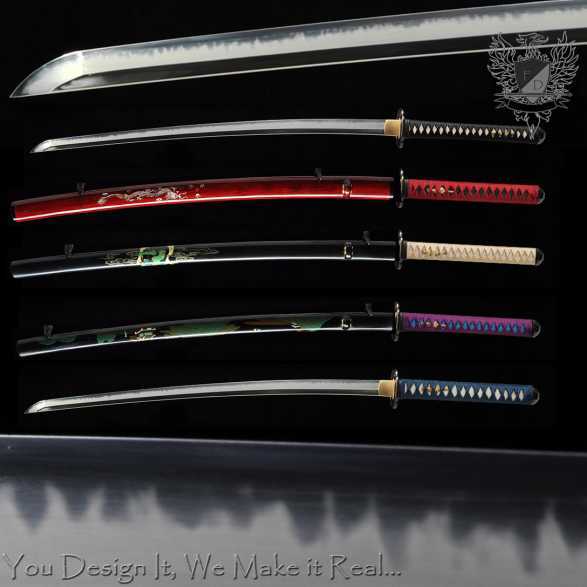 It is of the so-called Emperor Series - 29" blade length, 41 3/4 oz weight, hardened 1060 Carbon Steel and was supposed to be fully sharpened. I was disappointed to discover that the edge was not uniform in its finish and sharpness. 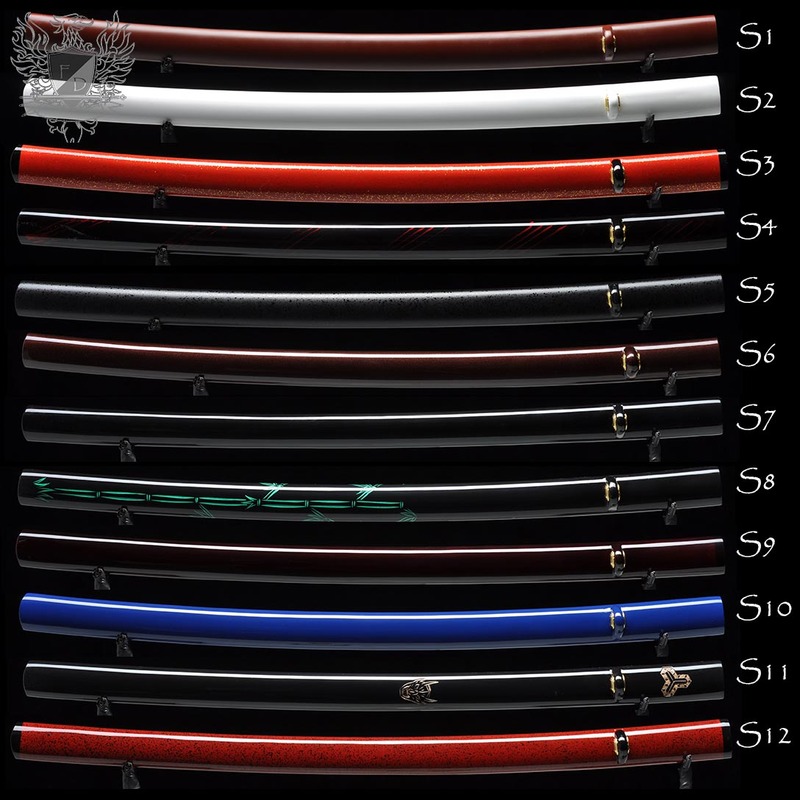 While trying to teach myself how to sharpen a katana (which is not easy) I discovered the SBG website. 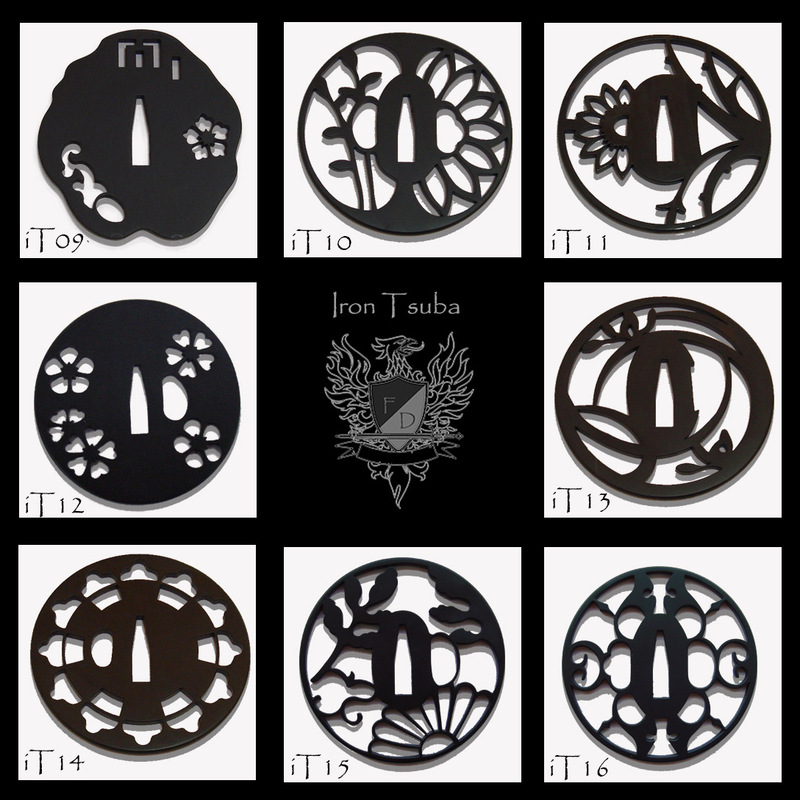 The Forge Direct Elite Katana is a differentially tempered T 10 tool steel. Its edge was beautifully finished, uniform and VERY sharp. It weighs 34 1/2 oz. I am extremely satisfied. Yes it took about 2 months between ordering & delivery but when I saw the result the time did not matter. The Forge Direct katana comes across as a full-sized sports car in comparison to a standard sedan. I must mention that Director Paul Southren was accessible at all times and most helpful. He eased my insecurities and inspired trust & confidence. 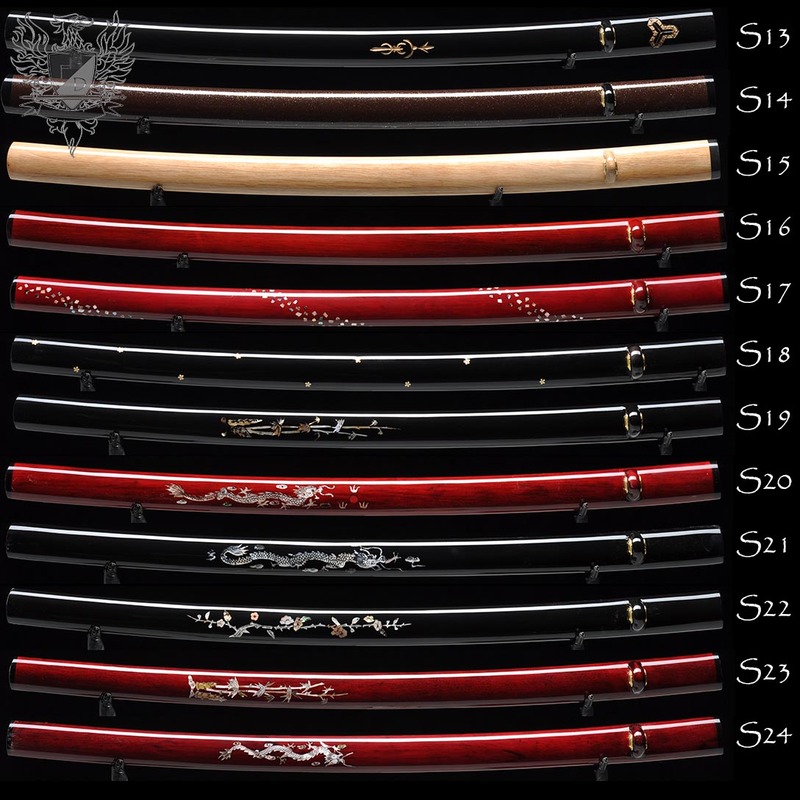 I am happy to recommend Sword Buyers Guide, Forge Direct & Paul Southren. I will certainly be a repeat customer. Thank you to all of the craftsmen for a true work of art.